Sensei Nehan Myoshin Tricia Teater is the Director and Guiding Teacher of Udumbara Zen Sangha of Evanston. 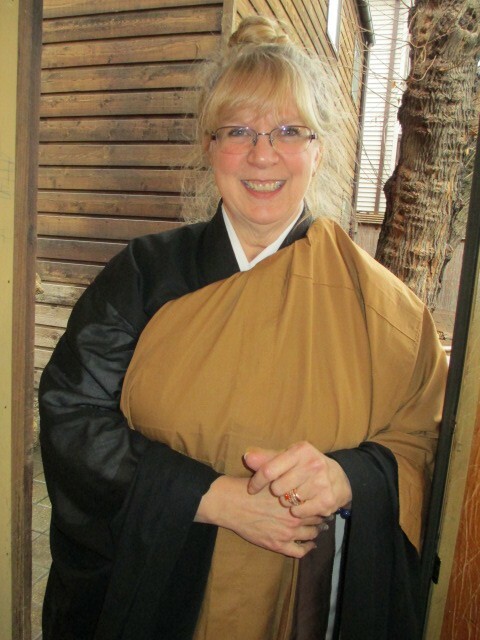 She received Dharma Transmission from Roshi Diane Martin in 2012. A lifetime commitment to volunteerism and chaplaincy work, Sensei has served for many years as a team member of Horizon Hospice and Palliative Care of Chicago (now Journeycare) . She has worked in maximum security prisons and on death row in Indiana and Illinois for approximately 20 years, conducting Buddhist meditation services, offering spiritual support, dharma teachings and hospice care. Sensei served as President, Death Row Visiting Coordinator and ongoing Board Member for the Illinois Coalition to Abolish the Death Penalty. She has traveled to Calcutta, India, working with Mother Teresa’s Missionaries of Charity at the Shishu Bhavon Children’s Home and she has recently (2010) traveled to Poland to bear witness at the death camps of Auschwitz and Birkenau. Tricia received her Master’s Degree from Roosevelt University and is certified in conflict resolution and mediation. She is retired from her post as Director of Human Resources for Cook County Clerk and dedicates her time to the Udumbara Sangha.